As the challenger discount supermarkets continue to expand their market share, more established rivals are reacting in differing ways in their attempts to recoup lost ground. Iceland, the supermarket known for its inexpensive frozen produce, has been trying to reposition itself. By improving the quality of its offering it is aiming to broaden its appeal in the minds of former and future customers. Where once it was known for the gimmicky ‘kebab pizza’, Iceland now wants shoppers to consider more top-end items such as scallops, swordfish and kangaroo steaks. YouGov BrandIndex indicates that the change in direction has made a difference to consumers’ perceptions of the brand. Over the last twelve months its Index score (which measures a brand’s overall health) has seen the greatest improvement compared to any of its supermarket rivals apart from Tesco. However, given its low starting point it still lags behind its average sector score overall. 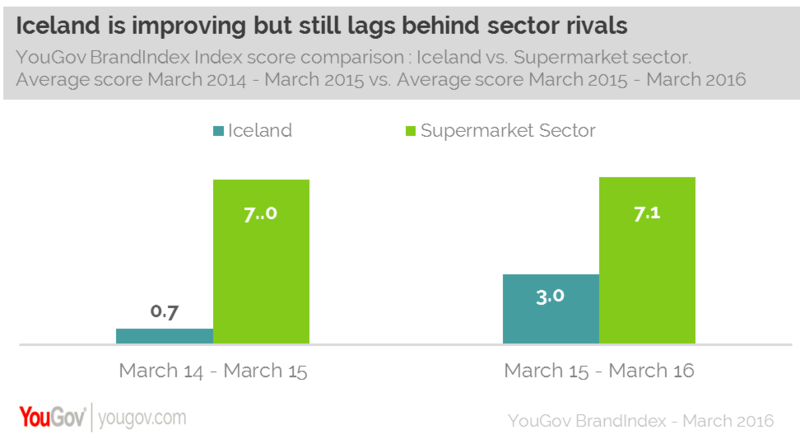 The data suggests that although Iceland’s reputation is improving, its Purchase Consideration score (whether a respondent would consider buying from a brand) has remained relatively static over the past year. In recent years, Aldi and Lidl have both prospered by offering quality goods at competitive prices. But why have these outlets expanded their customer base though this strategy while Iceland has stayed relatively still? The main problem is likely to be brand association. Aldi and Lidl are fresh faces to consumers and have been able to define themselves straight away in the minds of consumers as offering fresh food at affordable prices. Although Iceland is gradually shifting the dial when it comes to what it represents, how people feel about the brand is deep-rooted and built up over decades on the high street. This perception can only be altered permanently when a meaningful change in offering is coupled with effective and powerful long-term campaigns that re-cast a brand’s story. So while there are encouraging signs for Iceland, far more needs to be done to convince potential consumers in from the cold.